Just about everyone has a favorite pair of bluejeans. What wardrobe would be complete without a great pair of jeans. 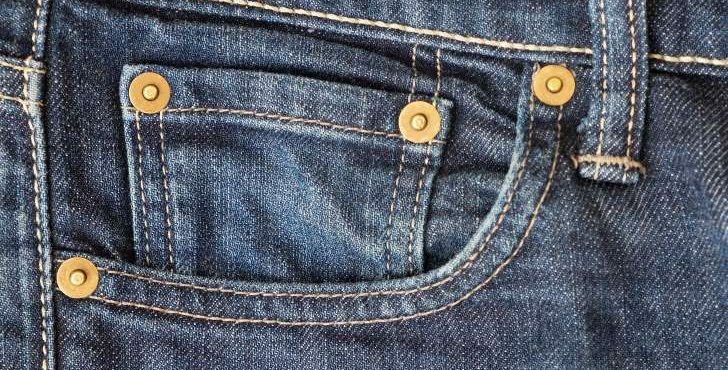 Most of us rarely notice that “extra pocket” on the right side of our jeans. Since it has always been there, we don’t give it a second thought. How many of us really know what it was designed for?? The fifth pocket was introduced in the 1800’s as a protective sleeve for a cowboys’ pocket watch. Although the pocket is rarely used for watches today, standard jeans are still being produced in a way that can hold a size 16 pocket watch. Over the past couple years, it has become an increasingly popular spot to store technology devices such as cell phones or iPods. It is also used to hold coins, lighters, or a pack of gum etc..
What is a vest pocket? A watch pocket is a pocket sewn into a garment, typically a vest, that is intended for use as a carrier for a watch. 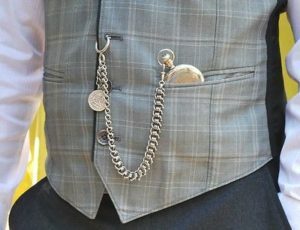 Pocket watches were made to fit into a person’s pocket and are attached to a length of chain that can then be fastened to a waistcoat or belt loop. Such watches were especially popular among men wearing three-piece suits that consisted of pants, a coat, and a vest. 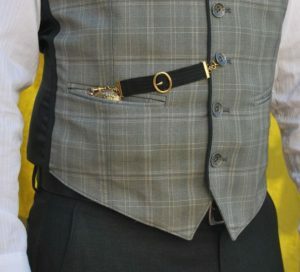 The vest of the suit would typically have a small pocket on one or both sides at about the midsection that was intended to be a watch pocket. What is a Watch Fob? A fob is a short strap attached to an pocket watch to make it easier to handle. Today, small devices attached to keys are sometimes called fobs. Before World War I, watches were carried in pockets. They were attached to short straps that could be leather, ribbon, or metal chain. The strap made it easier to remove the watch from the pocket and easier to handle the watch securely. 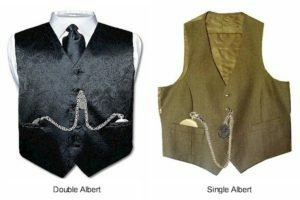 Men usually carried their watch in a small pocket on the waistcoat, called a fob pocket. Around 1775, waistcoats had several pockets. The fobs hanging from each pocket became quite elaborate, and small personal seals were often attached to the free end. As chain-style fobs began to be made of jewelry quality metal such as gold, silver, or even platinum, they began to be called watch chains or fob chains. During the Victorian period, fob chains of human hair were quite popular. Many Victorian wives were happy to braid a lock of their own hair into a fob for their husband’s prized watch. 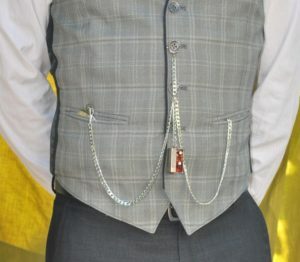 Railroad conductor with pocket watch and vest chain. Mark I really love your articles about watches. I rarely comment but want you to know how much I enjoy reading them. Never thought there was so much information about watches and how they function, how they are repaired, who collects them and why, which ones are collectibles, and how they have influenced our history, clothing, and architecture. They also chronicle the advancement of man. And all this time I thought it was just a watch! Please keep the articles coming. Thanks for another informative post, Mark! For those new to wearing a pocket watch with vest, usually new vests come with the watch pockets sewn shut! This, I am told, is to help the vest keep its shape if the pockets are not used. Usually it is a simple matter to cut a stitch INSIDE the pocket, which will pull loose, allowing the pocket to be used. Remind me of the name of the railroad in the picture. I would like to take a ride ! Always been a fan of the pocket watches and wear one almost daily. A couple of them I bought from Mark and he has serviced most of the rest. Great story I don’t use or own one. I have used watch pockets for about 60 years. Thanks for your informative emails ! I still use a SS case Hamilton 992b at work. I work for a railroad and they’re still allowed for use. Justin: That is a trolley museum somewhere. That is a Cincinnati Curve Side car. They had them on the trolley system where I grew up, back in the day. If you are in Eastern USA I highly recommend visiting Steamtown National Park and the adjacent trolley museum. Also Strasburg, real live steam, adjacent Pennsylvania RR museum, and also Western Maryland Scenic, wonderful ride up to Frostburg from Cumberland, not steam right now but soon to be, with one of the most historic US steam engines ever, ex-C&O 1309. All have operating personnel who proudly wear their authentic RR attire including the ubiquitous pocket watch. 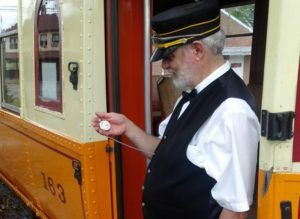 I am holding a Hamilton 978 Electric Railway Special beside a York, PA car at the Rockhill Trolley Museum in central PA. I learned the hard way to buy vests with a breast pocket as the watch would fall out of the low pocket when leaning over to turn track switches! Great piece on how to carry the pocket watch. 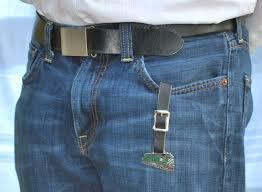 Use fobs with my jeans and a decorated vest chain for cowboy re-enactment. You’ve worked on my 1887 Hampden and it’s working flawlessly.